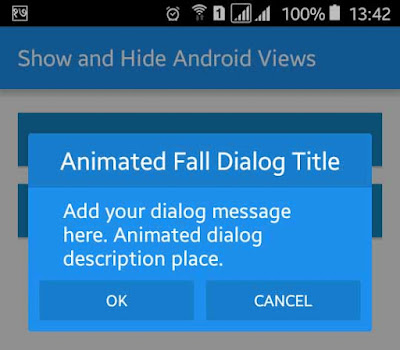 Alert dialog is one of the important user interfaces (UI) design component in android application. An alert dialog box is a small window where users decide some decision or enter some information. If you want to display an alert dialog box to your application with animation effect you are here in right place. In this tutorial, you will learn to display material design alert dialog box in your app with animation effect. Dialog box is also used to display message at the time of getting error or new updates about the application. It’s simple to display dialog in android just follow following simple steps. compile 'com.github.sd6352051.niftydialogeffects:niftydialogeffects:[email protected]' as project dependency. Build.gradle file will looks like below. Open your app XML layout file and add some buttons with different onClick attributes. Here, I have added four buttons with onClick attribute animatedDialog1, animatedDialog2, animatedDialog3, animatedDialog4. XML layout file will looks like below. Now, this is time to work with java code. Open your app java activity file and add dialog title text, message text, dialog box color, button text, and effect type like the below. You can use other different effects like Slideleft, SlideBottom, Fadein, Newspaper, RotateBottom, RotateLeft, Slit. 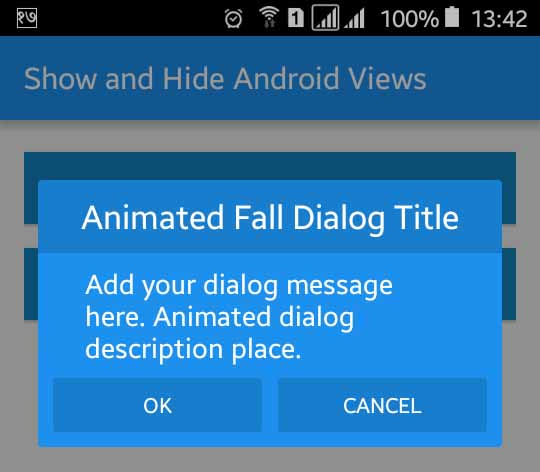 Run your Material Design Android Animated Alert Dialog Box Example application and click on the buttons, you will see dialog box with different animation effect. If you need other types of animation you can use above animation effects.